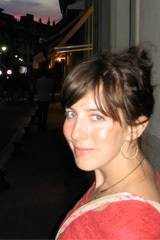 Andrea Golts completed her Master of Arts in English in 2005, and soon afterwards moved to Hood River. She co-founded Rediviva magazine in 2007, an alternative “art, culture & environment” publication that was printed for three years. As editor of the publication, she worked with a diverse group of writers on a variety of topics, and learned a great deal about culture and community along the way. When not blogging or playing music, she can usually be found on a trail—mountain biking, snowboarding, or hiking to new peaks.